CoLab Radio » Blog Archive » Khirkee Unauthorized? 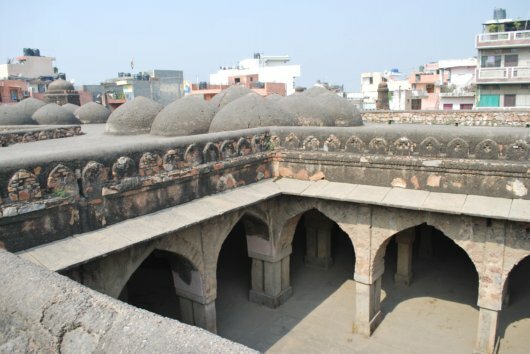 View of the homes in Khirkee Village from the top of the Khirkee Mosque. Today was the first day of the Urban Typhoon Workshop. Finding my way there seemed easy in the morning. The neighborhood is located directly across from Delhi’s popular Select City Shopping Mall. My taxi driver managed his way through the main roads and highways of Delhi, stuck in morning traffic here and there, but generally moving along the smooth, clearly marked thruways. However, upon entering Khirkee, the car had to slowly climb over broken pavement, rubble, and dirt roads. No lane was marked and we asked for directions three times before we finally found Khoj International Artists’ Studio, the location of the conference. A dirt road in Khirkee Village. I soon learned why the infrastructure inside Khirkee was so poor. 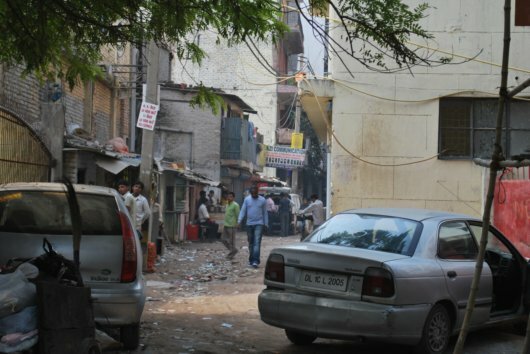 During orientation, the organizers told us that there is “Khirkee Village”, which is an official, demarcated neighborhood in New Delhi and then there is “Khirkee Extension”, which is “unauthorized” and exactly adjacent to the village. The Khoj Studio is in Khirkee Extension. Apparently, there are more than 1300 unauthorized neighborhoods such as Khirkee Extension in the city, usually comprised of migrant workers. These areas are not legally zoned for residential or commercial development and therefore are not recognized as actual places in need of municipal services and amenities in New Delhi. Utility companies are privatized, and so it becomes easy to become a full functioning neighborhood without the city’s help. These migrant momo makers live and work in Khirkee. Momos are a popular Chinese dumpling snack in India. These momos are delivered and served at the mall across the street. 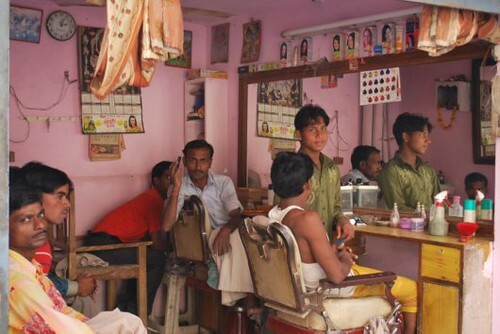 This typical hair salon for men is busy in Khirkee. Nonetheless, residents of Khirkee Extension want the city to recognize their neighborhood and provide services such as paving their main road to facilitate easier transport and prevent flooding. 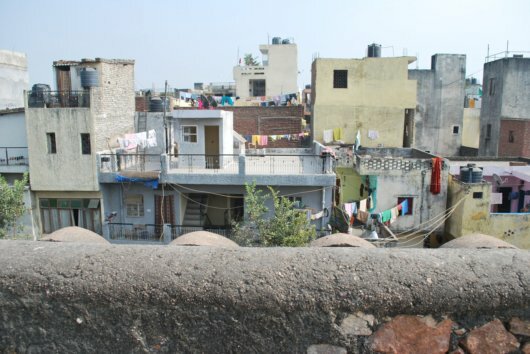 Legitimizing unauthorized areas is a very complicated issue in New Delhi because it sets precedents and expectations about how the city needs to treat and use its limited resources for the thousands of illegal settlements within its borders. 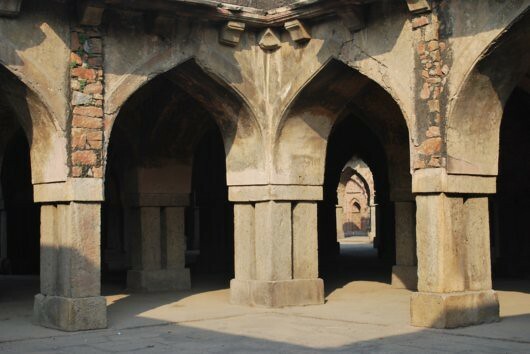 I also learned that the Archeological Survey of India (ASI) is opposed to formalizing Khirkee Extension because of the fear that this would ultimately harm the preservation of Khirkee Mosque, which is over 700 years old and in the middle of Khirkee. I found this fact interesting given that current residential development is just five feet away from the mosque, and the beautiful site seems to be ignored by the surrounding inhabitants. And the brand new mall across the street adds even more complexity to the issue. With such a popular facility nearby, the land of Khirkee Extension has become quite valuable and gentrification could further change the character and legitimacy of the place. The first day of the workshop was spent exploring Khirkee and meeting other participants which included architects, planners, artists, poets, and social scientists from all the over world. In the coming week, we will form into smaller groups to complete playful, interactive projects with residents of Khirkee that will hopefully help everyone – insiders and outsiders – to better understand the area’s identity. The idea is to combine local knowledge with creative approaches to brainstorm a viable and sustainable future for Khirkee. Great photos Aditi! I am enjoying following your trip! What utilities are privatized? Can they get sewage and water without the government involvement or just electricity? Electricity is privatized, but water is not. However, people hire companies to simply bring big tanks of water to their house, which are connected through pipes. They then have the company refill these tanks as needed. And yes, unfortunately, sewage is a big problem! I love the colors in these photos! The story about the mosque preservation and the mall gentrification issues is so interesting. Is the mosque still in use? Your post really illustrates the variety of different interests that are at play with the formalization of the Extension, and how planners’ actions aren’t ever neutral. It’s sobering that even providing such a basic service as paving a road can displace informal settlements and jeopardize a community. Aditi, I wish I was there with you. Amazing photos. I wonder what will come out of this conference? Interesting relationship between private utilities, government, and the informal settlement of Khirki. Wondering about the pros and cons of having private service providers. Are you all talking about what other resources should be offered through public or private channels? Where do the boundaries end?